Those of you who have worked with me, know that I’m a firm believer in The Reframe – as in, taking an experience, turning it on its head, and presenting an alternate vantage point. Reframing has been one of the most useful tools for me in my own personal life, as it provides me the opportunity to see beyond the part of a situation that is causing me undue stress or triggering a nerve. And truthfully, I’ve said all three of these things as well – often even – when it’s come to describing why I didn’t follow through or keep my promises to myself. Promises around moving my body. Promises around making space to write a couple of pages each morning. Promises to go to be earlier. The fact of the matter is, when you say I’m to busy to… what you are really saying is I’m choosing not to make this a priority right now. 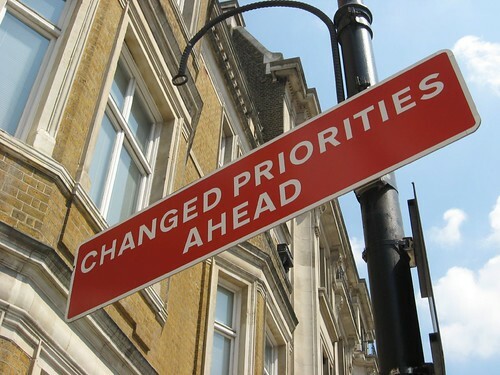 Now – that’s OK. We do not have to make things priorities at all times and we can and should reserve the right to change our own mind, even when it comes to things that we’ve promised up and down that we want, if it just doesn’t feel right. But it is very important that you realize that this is a choice that you are making. You are deciding that going and spending time with a friend is more important to you than running today. Or writing in your journal. Or cooking yourself dinner instead of microwaving up something easy. However, there are moments, those moments that we typically don’t view as choices, when we just don’t get to something because we’ve been frittering away our afternoon on Facebook or watching Pretty Little Liars or oversleeping. Those are choices too, and it is important that you view them that way. You get the deciding vote on how you’d like to spend your time, and when you find yourself pushing those things that are really important to you – like, taking care of yourself – to the backburner, it is time to peek into why that might be happening for you. You’ve said that you need it. You’ve said that you’re tired of living this way. You’ve said that you’d do anything to feel better. You’ve said that you can imagine exactly what it might take. I’m curious – what deep desires have you been shuttling to the end of your to-do list, week after week? It is still important to you? How might you make space for it, today? If this post struck a nerve for you and you’ve got something that you would like to start making a priority in your life – right this second – I’d love to help you unravel your resistance around it. Check out my offerings here or contact me. You know what I want to do and I didn’t do yet, even if I do need them? Buy a new pair of glasses. I didn’t change them yet because 1.) they’re a bit expensive – I’m as blind as a bat – and 2.) they’re a sort of psychological crutch for me, thanks to the fact that my ex-husband asked me to take them off before slapping me in the face. So now, when I’m not wearing them I feel like… vulnerable. I need to thank my spiritual leader for showing me so; now I need to really learn to be without them to then take the leap of faith and ask for a new pair, more beautiful and fancier. Perhaps as a good intermediate step, you could go and try on some new, more beautiful and fancy glasses – just to get the feel of them on your face – before committing to replacing the pair that has been with you so long? I honestly just have too many things that should be a high priority. I have my hobbies that keep me sane, about three of them, but they’re all “sit-down” hobbies. My job is of course a priority, because I need to eat and pay the rent and such. Friends are a priority, because I really need human contact. Exercise is a priority. Something has to give. I only have 24 hours in a day. And giving anything up is basically screwing up my life in some way or another, because all these are pretty basic human needs (creativity, work, contact, physical exertion). Absolutely understood Aurora. I am familiar with the feeling of having many, many competing priorities. But, yes, something has to give, if you are feeling worn out and over-scheduled. Is there any solace in stretching the activities out over the week, so that you have a little time each day to yourself? Mara, did you write Pretty Little Liars with me in mind (I obsessively tweet about it…) or maybe you have the same obsession! I couldn’t help but smile at myself, reading that. I’m struggling with the same thing as Aurora – having SO many priorities that I get overwhelmed by all of them, and then watching PLL/going on the Internet becomes my avoidance default position – that way I don’t have to do anything. And then I get mad at myself. Go figure! Haha. But yet, they have time to catch up on TV shows, go to parties, and go to the gym. Thanks so much for saying in print what I’ve been saying for years! There’s no judgement involved, just a question of acknowledging what is. Unless and until we start doing that, we will just be fooling ourselves.